Keep your exterior water filter up off the ground and closer to the water fill on your RV. Accomodates most canister type and inline filters. Relieves stress to hose and fittings by keeping your filter securely held in place while in use. 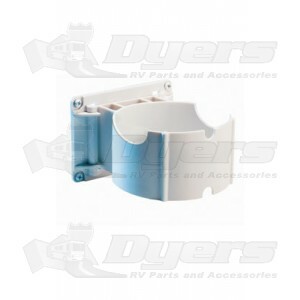 Protects your RV or watercraft from damage caused by unsecured filters banging into it. Holder slides in and out of mounting plate which is permanently attached. Extra mounting plate included which can be mounted in storage compartment to hold filter when not in use.